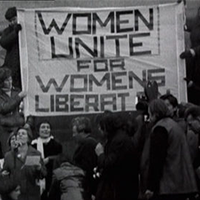 A landmark and today still urgent work of feminist and political cinema collectively filmed and constructed over years by the Berwick St Collective, active throughout the 70s and integral to what would become known as the reflexive tradition in British documentary film, Nightcleaners follows the personal and political struggle of the women who cleaned London’s office blocks at night in their campaign to unionise. Breaking free of the constraints and limited scope of their initial intention to film a more conventional campaign film to become something more complex, questioning and concerned with distance, as Marc Karlin one of the filmmakers would put it, that between workers and managers, but also the distance separating the women and the white male union bureaucrats, the detached socialist intellectuals, the artists, including very much those making this film who are never spared implication throughout. Understanding the nature of this distance, whether it is at all negotiable and how these tensions sit within a broader political context are central and the Collective deploy and rely upon structure and form equally to content to explore them. A complete and confident response to the then little challenged doctrine of observational film in British television Nightcleaners also serves as a dialogue into filmic representation and experiment in the ideals of collective radical filmmaking put in practice. The parallels to today and in too many ways unchanged exploitation faced by and terrain of struggle for the low-paid, precarious, now usually outsourced still mostly women workers who clean our offices, institutions, shops and streets and are treated like the dirt they are tasked with are unmistakable and damning. For International Working Women’s Day Deptford Cinema is screening this essential documentary rarely seen on the big screen followed by a discussion that will look at and compare the campaign for pay, conditions and dignity depicted in Nightcleaners to those being fought and in more and more places from the LSE to the Daily Mail won. The conversation will highlight the gendered and racialised nature of this kind of labour and role in recent years of the rank and file organising and joyful militancy of grassroots unions United Voices of the World (UVW) and International Workers of Great Britain (IWGB).